Ideal No Fuss, Grab-and-Go Telescope Mount for Easy Visual Astronomy as well as Daytime Terrestrial Observations!! 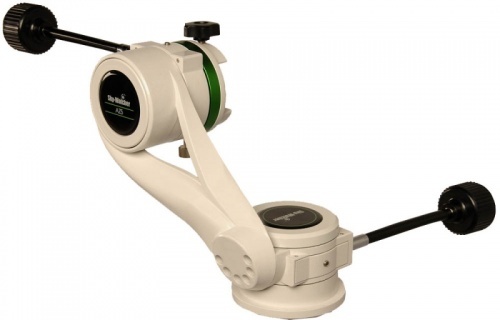 The elegant and well engineered Sky-Watcher AZ5 is a lightweight, highly portable Alt-Azimuth mount constructed from cast aluminium, designed to attach small telescopes up to 5kg in weight, fitted with a 45mm dovetail bar. The aluminium telescopic tripod legs can be extended and clamped in any position using the integral leg locks. Supplied with two flexible slow-motion cables, one for vertical and one for horizontal smooth fine motion control. The mount can also be moved manually around each axis, for rapid panning and elevation adjustments. Accurately tracks distant moving objects with ease. A superb grab-and-go mounting suitable for both terrestrial observations and astronomical viewing.